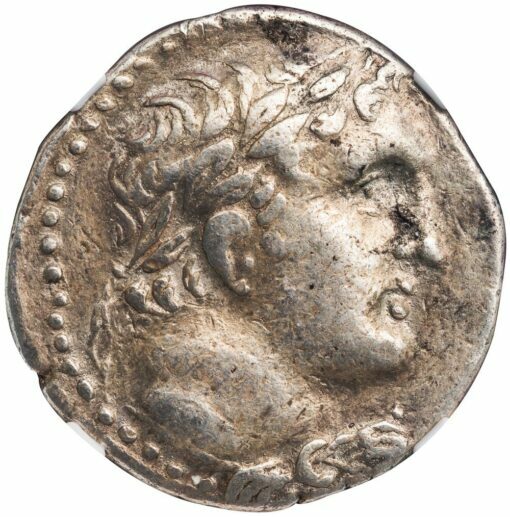 PHOENICIA. TYRE: JESUS BIRTH YEAR COIN. 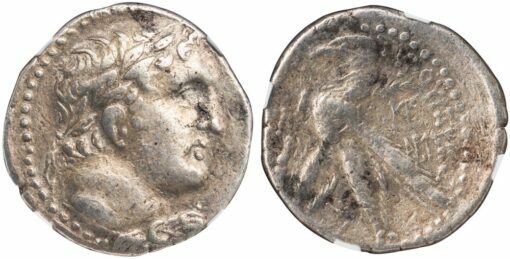 Silver Shekel, 14.16 g., 27 mm, minted in Year 120 (7/6 BC), likely the year Jesus Christ was born. Obv. Laureate head of Melkart right. Rev. Eagle on prow to left, PK above club in left field, KP above AXPI monogram in right field, letter Alef below eagle’s legs. DCA Tyre Supplement Release 2, no. 440 (same dies). NGC graded CHOICE VF, Strike 3/5, Surface 3/5. Tyrian year 158 corresponds to the latter part of 7 BC and the early part of 6 BC in the Gregorian calendar, a period frequently identified as the “birth year” of Jesus Christ (most scholars see 6-4 BC as the time range most likely for this, see for instance http://www.religionfacts.com/christianity/timeline). 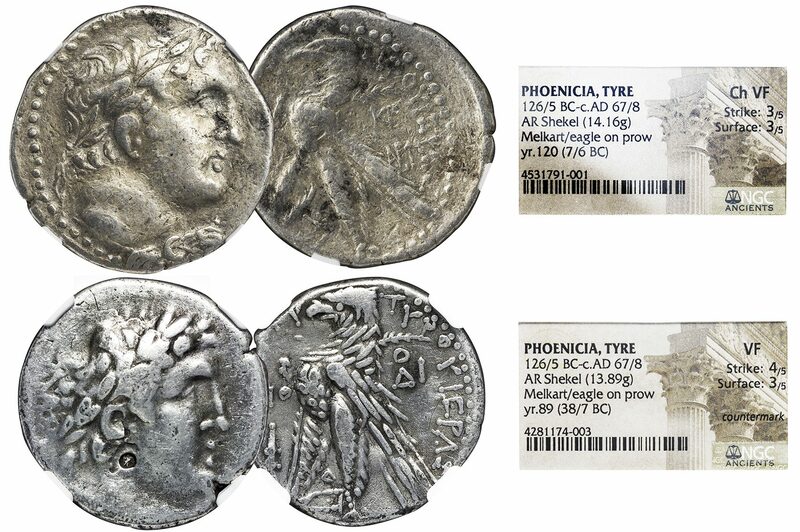 DCA Tyre lists two varieties for this year, this being no doubt the earliest as the same obverse die is used the previous year. Interestingly enough the control monogram that defines this particular issue incorporates Greek letters XPI, the first letters in Christ’s name; in fact this monogram visually resembles the later “Christogram” employed by early Christians as a symbol for Christ. 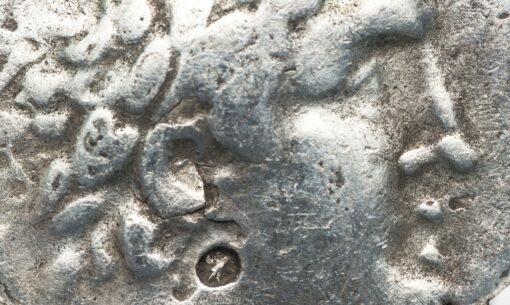 Therefore, through what must be an amazing historical coincidence, the shekel struck during the year Christ was born also bears his name on it. Shekels from Year 158 are extremely rare, this possibly being only the second recorded specimen with the XPI control (the other is illustrated in Cohen’s DCA Tyre as the plate coin). PHOENICIA. 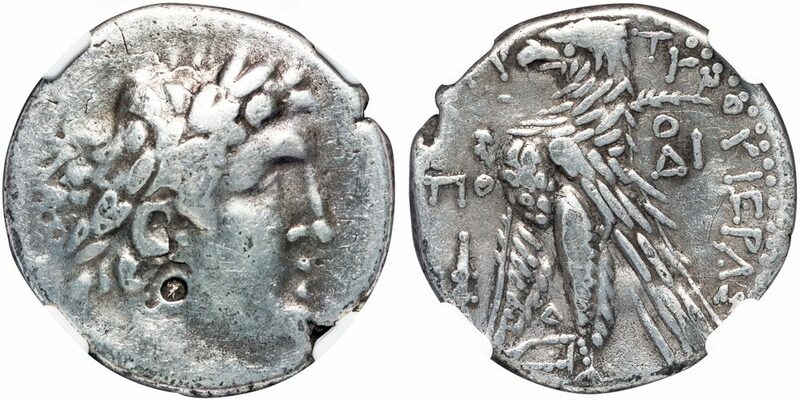 TYRE: “STAR OF BETHLEHEM” COUNTERMARK COIN. Obv. Laureate head of Melkart right, within dotted border, small “star” countermark on cheek. Rev. Eagle on prow to left, ΠT above club in left field, OΔI monogram in right field, bet between eagle’s legs. DCA Tyre Supplement Release 2, no. 309, however the COUNTERMARK USAGE ON THIS VARIETY UNKNOWN AND UNLISTED. NGC graded VF, Strike 4/5, Surface 3/5, “countermark” noted. 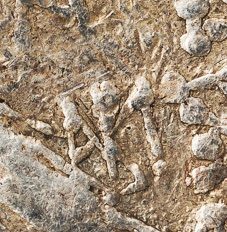 Ed Cohen, in his DCA Tyre Release 2, p. 13, notes that the star countermarks are extremely rare, with 9 specimens known to him. This is the 10th specimen that has been documented, and it features the small version of the countermark such as that on DCA Tyre no. 363. What is remarkable about this coin is that it is the EARLIEST KNOWN SHEKEL to bear the star countermark as those known to Cohen range from Tyrian years 92 to 115. The star countermarks remain a tantalizing puzzle. They come in two formats, a larger countermark where a star (or comet) is very clearly shown (cf. DCA Tyre no. 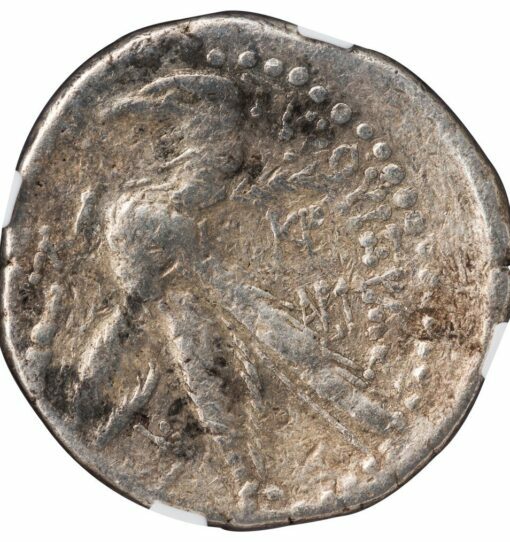 348) and a smaller version such as that on the present coin. Given that the last documented instance of its application was on a shekel of Year 115, it’s clear that these were applied sometime AFTER 12/11 BC, although it’s hard to be more precise than that. It is possible that they make reference to some astronomical event that occurred shortly after that date. Such an event must have been very memorable to the population at the time and may have had religious implications attached to it. It has been argued in the numismatic marketplace that the star countermarks do in fact document the “Star of Bethlehem” and hence were applied soon after the birth of Jesus Christ, although this remains simply a conjecture. 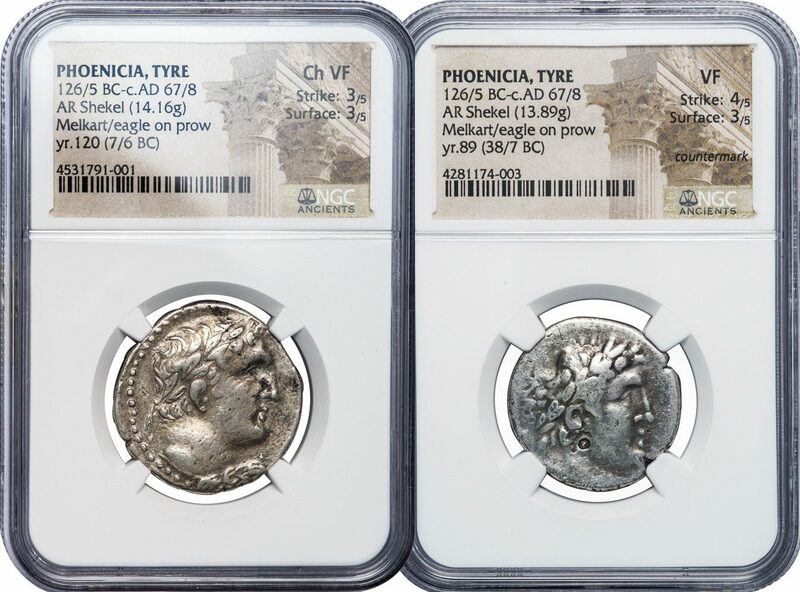 Whatever its origin, the star countermarks represent a highly unusual and extremely rare numismatic phenomenon for the Tyre series, and one that in all likelihood took place within the decade of Christ’s birth.